Mizoram state BJP president JV Hluna knows where the Mizo sentiments lie. At a press conference held at the state BJP office he asserted that his party believed in religious tolerance. He rubbished the allegation of BJP’s indifference to religious minorities in the country. JV Hluna who has recently helped BJP’s campaign in the states of Meghalaya and Tripura said his party has affirmed itself that sentiments of religious minorities in the region are respected. “I have the opportunity to share a platform with Yuva president of Meghalaya Egenstar Kurkalang, who is contesting from Nongkrem constituency in Meghalaya. I have made it known to him the pleas of the Mizo community residing in Meghalaya. 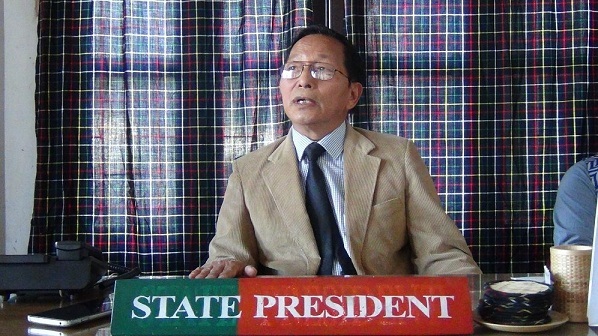 He has pledged to help the problems faced by the Mizo minorities of Meghalaya,” JV Hluna said. The allegation that my party has been discriminating the religious minorities has been proved wrong in Meghalaya. The party distributed a booklet on BJP’s stand on Christianity and it was well received by the Christian community in Meghalaya. The booklet will be translated into local languages of the region, JV Hluna said. The Mizoram state BJP president is convinced that the political tide of the region is the process of saffronization in tune with the rest of the country and ascertained BJP will form a new government in Meghalaya. “The BJP has given a political platform for the tribal communities under the banner of Indigenous People Front of Tripura (IPFT), several candidates were on the fray and Cabinet berth for those elected is ascertained,” the Mizoram BJP head said. “In fact, it was Assam cabinet minister and NEDA convener Hemanta Biswas Sharma who stood up for the Christian communities of Jalukbari, near Guwahati when miscreants attacked their church,” JV Hluna said. On the scenario of Mizoram, his home state, JV hluna said the party will be contesting from all the constituencies in the coming elections which will be had later this year. “New units are constituted every day, even in Mizoram also, minorities here know that BJP is the mother of all races, they happily embraced us and we are convinced that we will take all the seats in the frontier areas where minority Chakmas and Brus settled,” JV Hluna said.